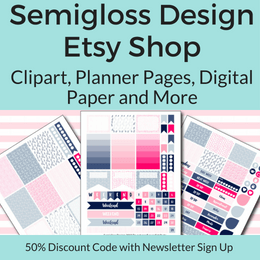 Seven long weeks ago, I started with a design plan and a mission to give my garage a vintage inspired makeover. Today, my garage is finished and functions a million times better. It’s even pretty cute! 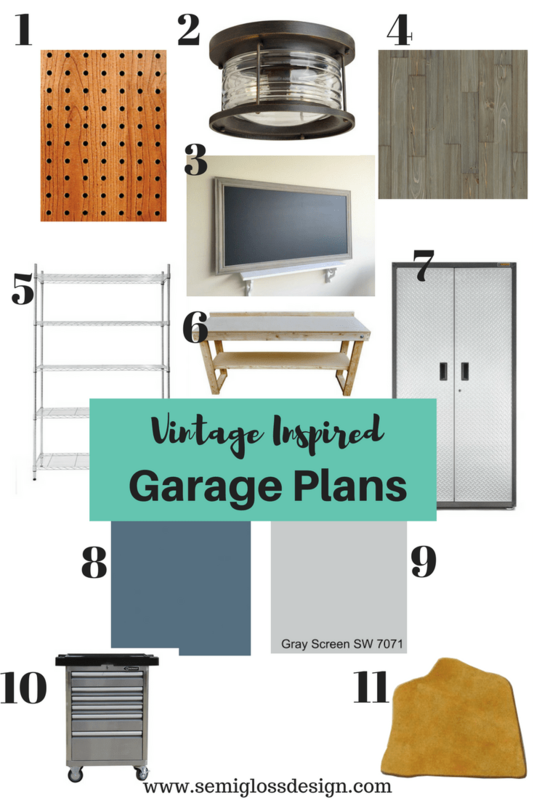 I’m so excited to share my vintage inspired garage today! Big thanks to Linda from Calling It Home for organizing and inspiring us. 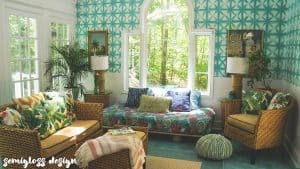 Have you seen the rooms of the featured designers? So much inspiration! Twice a year, I actually complete a room thanks to Linda. 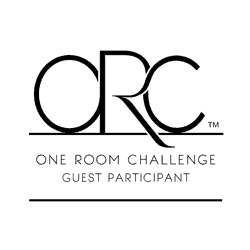 I’m joining the One Room Challenge as a linking participant, along with 200+ other DIY enthusiasts. 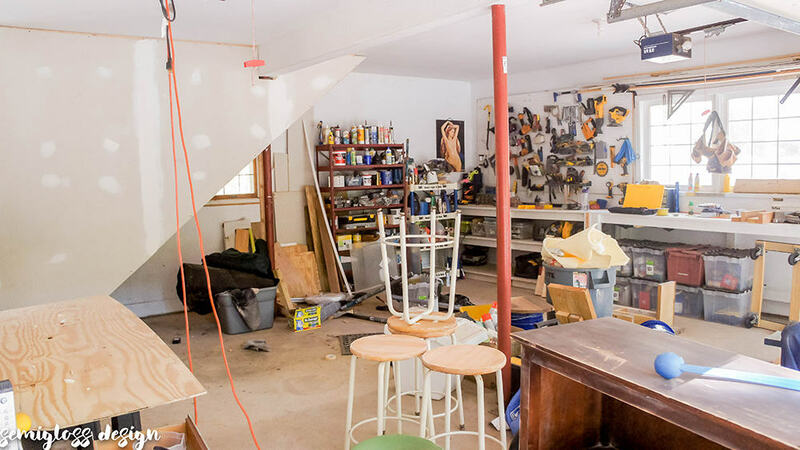 Before it was a hoarder’s cove of unfinished projects, garbage and other messes. My plans changed a bit along the way. We needed way less storage units than we thought because we got rid of so much junk. 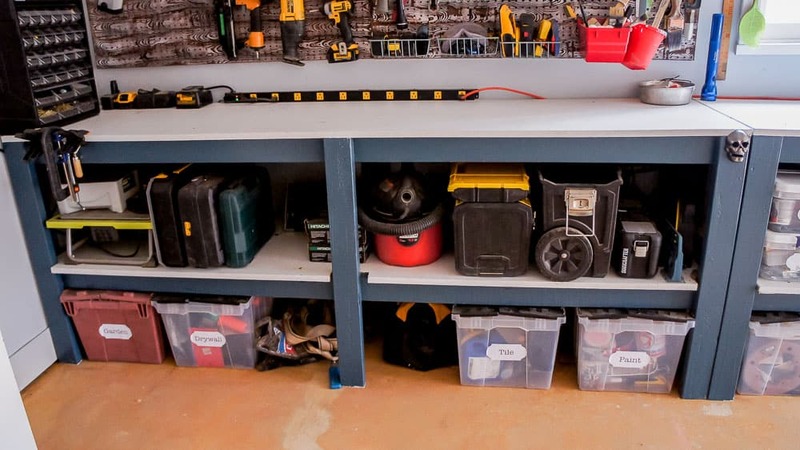 We also saved money by buying a used toolbox for a fraction of the cost of a new one. Look at all that lovely space. This is hubby’s work side. The vintage cabinet in the back was purchased to be refinished, but we kind of love it in here. To be honest though, it doesn’t really serve a purpose. 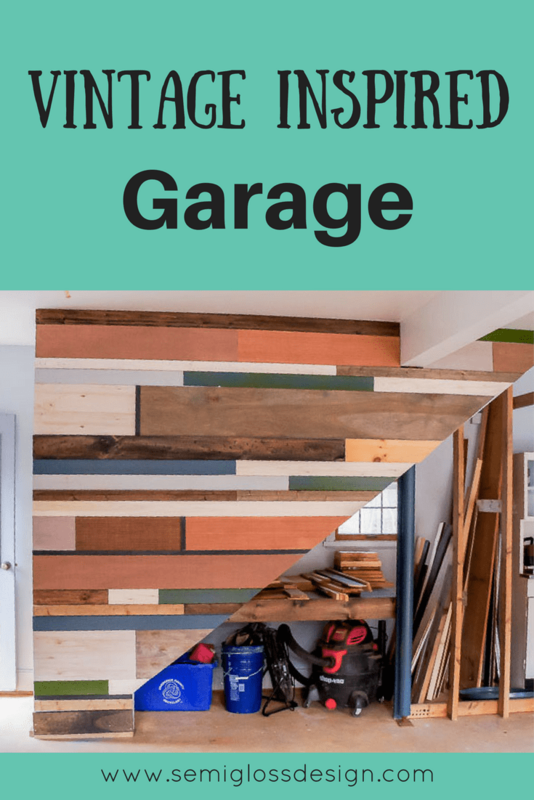 The star of the garage is the scrap wood wall. We were able to use up some unwanted scraps and create a fun accent wall that makes us smile. We used the weird space under the stairs for more scrap wood. 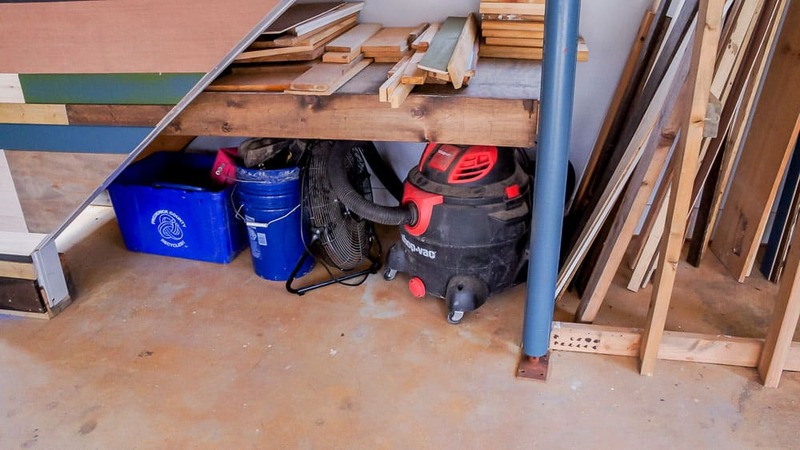 Building a shelf gave us a place to store the shop vac. You have no idea how happy that makes me. That thing never had a home before. 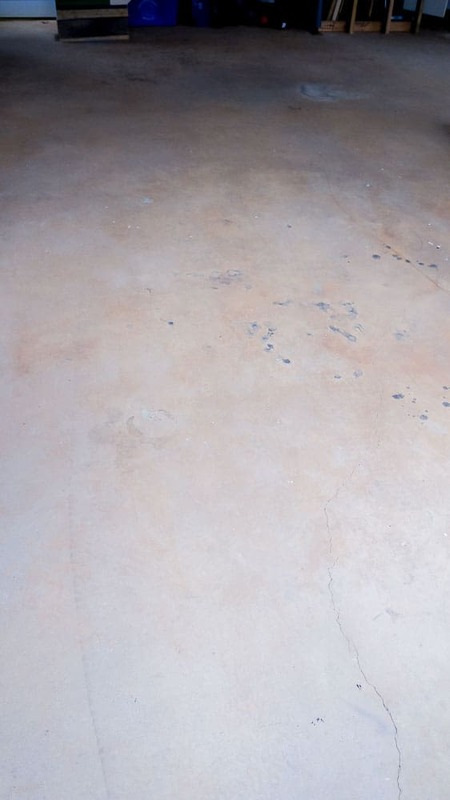 The floors were the biggest disappointment. I don’t think they’re bad, but they’re not how we envisioned them. It’s not a huge deal because they don’t feel precious to us now. 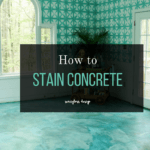 If I drip paint, I’m not going to cry. The pegboard wood grain design turned out really cool. And now the pegboard is nice and sturdy. We did a lot of reorganizing, so that it functions better too. 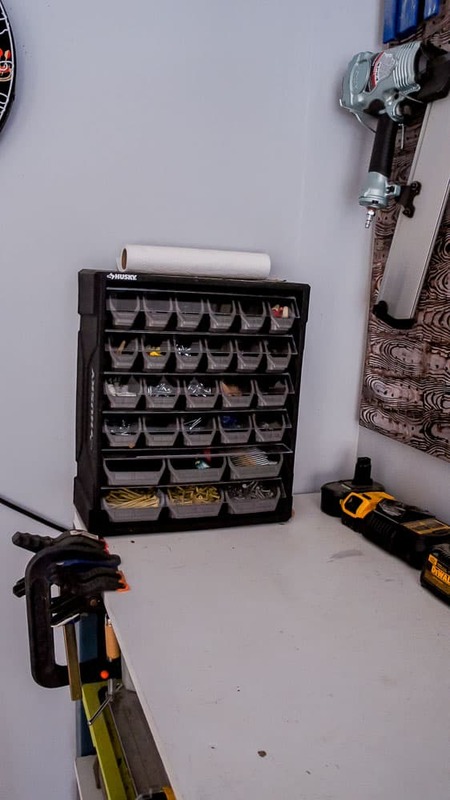 We traded our rickety old nail organizer and various bins and boxes for a sturdy nail organizer. Very convenient for building now! The old work benched were painted to match the room and they look a lot prettier now. All the bins are labeled and organized into their job types. We reorganized the hanging rails to make better use of the space. It’s nice to have a place to put our stepladder and sawhorses when not in use. 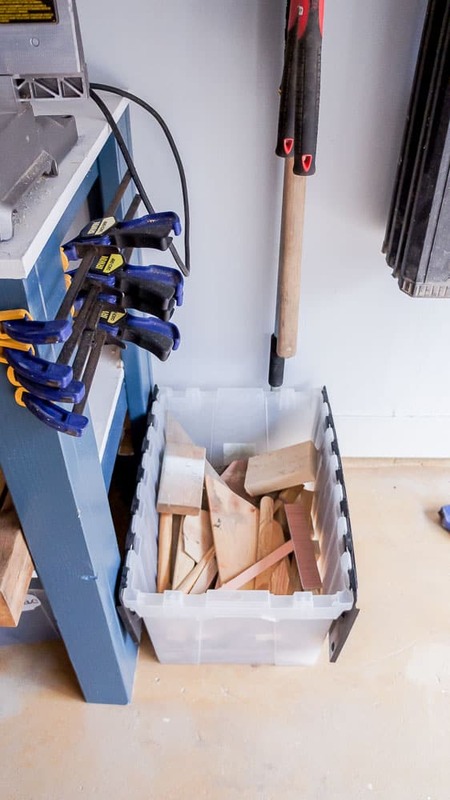 We added a dedicated bin for tiny scrap wood instead of just throwing it on the ground or in a cardboard box. 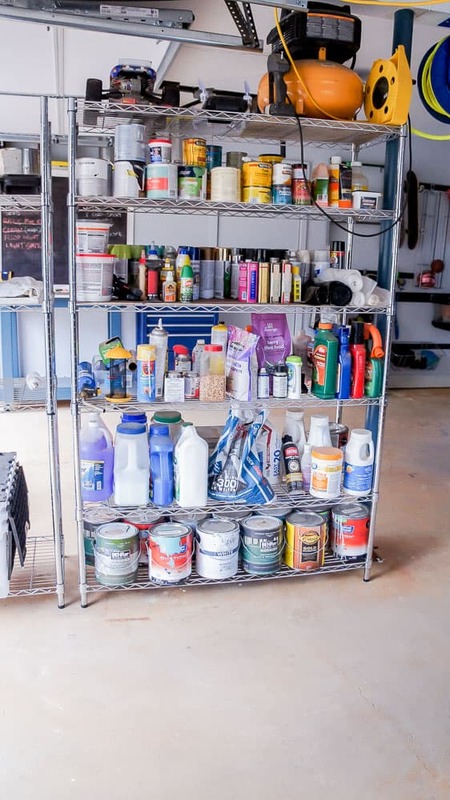 We bought 2 of these chrome shelves to organize all the chemicals and paint. It’s nice to see what we have at a glance. Only one shelf is fully utilized. The 2nd holds overflow stuff like tarps and stuff we’ve bought but haven’t installed yet. And this is my work space. It’s currently filled with vintage furniture waiting makeovers, but I moved everything out for pictures. The rolling workbench is my repurposed work desk from my former craft room. Having a rolling workbench is so handy. 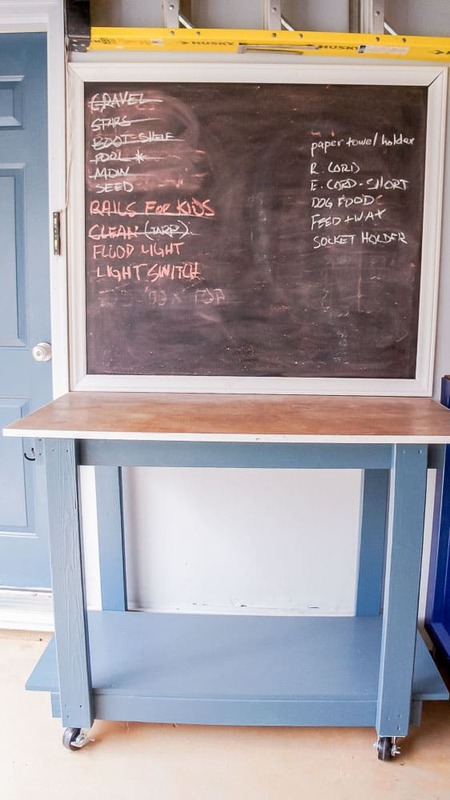 The chalkboard list is handy too. We can get so much done now! I love a good list. 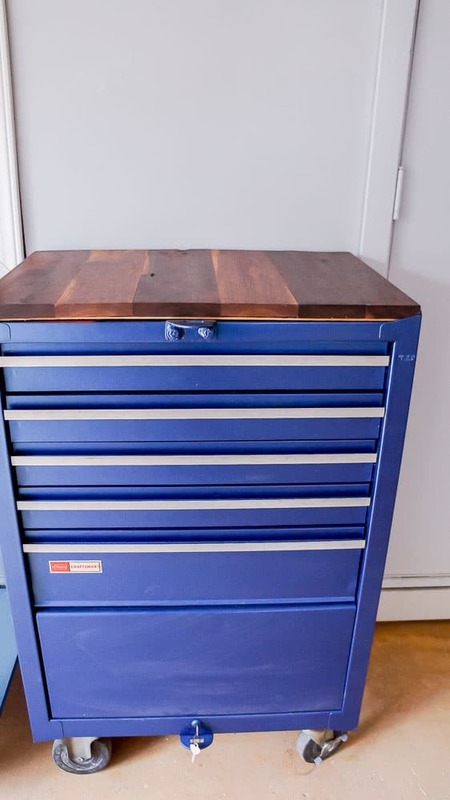 This tool box was purchased off of Facebook marketplace and given a makeover as well. It’s super sturdy and much nicer than the new ones we were looking at. We made a walnut top for it from scrap wood. These bins hold toys. No more searching for tennis balls for the dog to play with! It looks like we’re much sportier than we are. Haha. 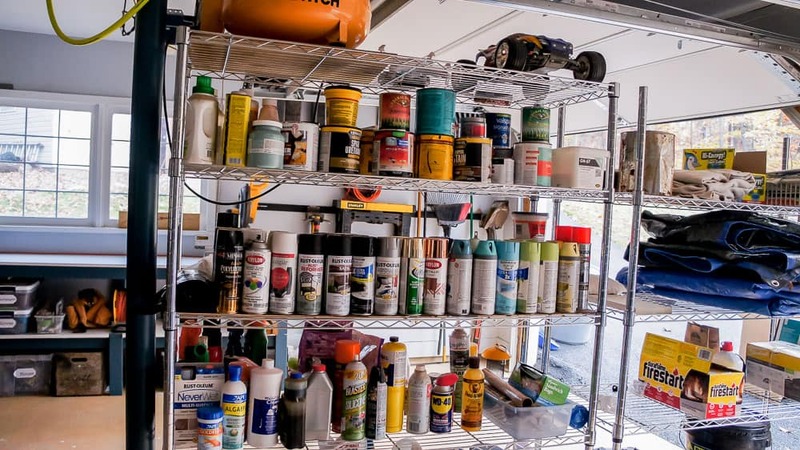 I organized my spray paint by color and it brings me such happiness. 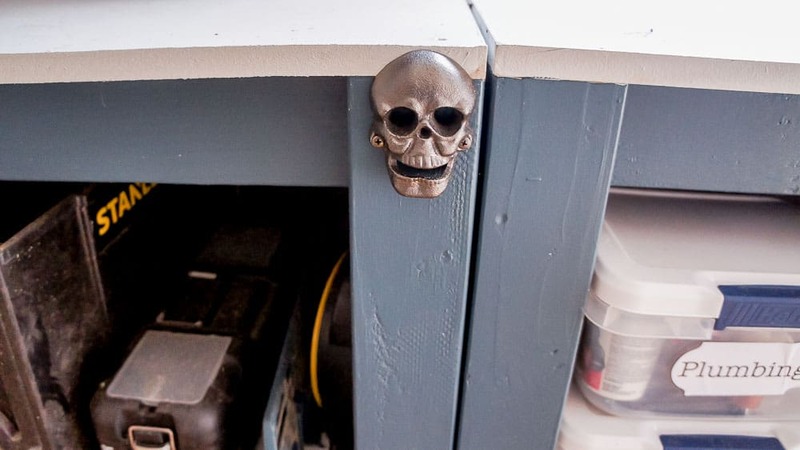 These shelves are super sturdy, which I love, but they’re not ideal for smaller container like spray paint. I cut some thin wood to size to put under everything. It’s so nice having all of my paint organized and together. 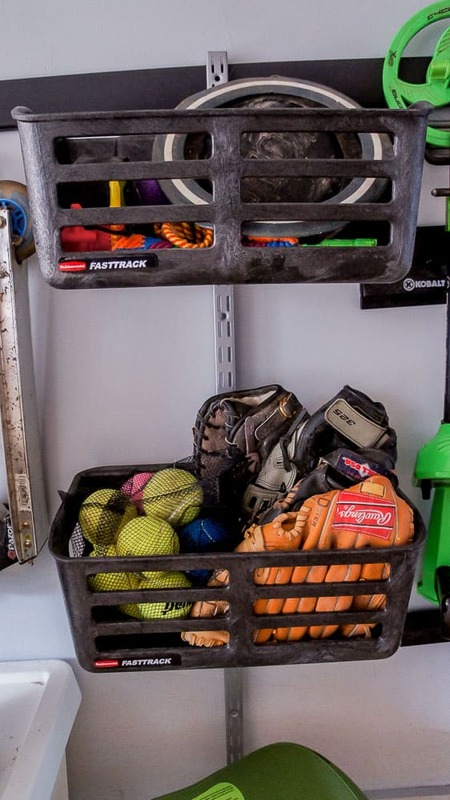 I talked about this last week, but we added retractable devices to organize our hoses and cords. This one keeps our pneumatic hose out of the way. And this one is a retractable extension cord. I love this thing. It’s so nice to not have to untangle cords anymore. For our lights, I went in a different direction. I really just wanted more light, so I took a chance on these barn light reflectors. The price was right and they have a cool industrial look. Plus, no electrical work is needed because it just screws into the existing light. It does provide more light, but the difference is more subtle than I hoped. I think once I change the bulbs to LED interrogation daylight bulbs, we’ll be good. 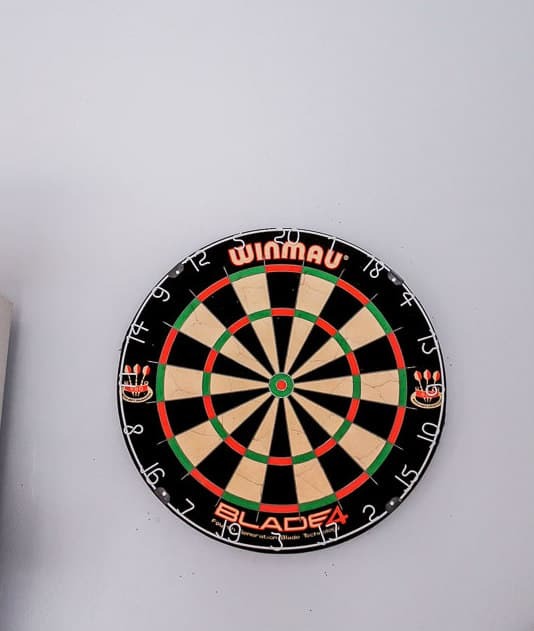 I have them in my basement and they do a great job there. Small things that make me really happy: painting the red poles to blend in. I can’t explain why it makes me so happy, but it does. 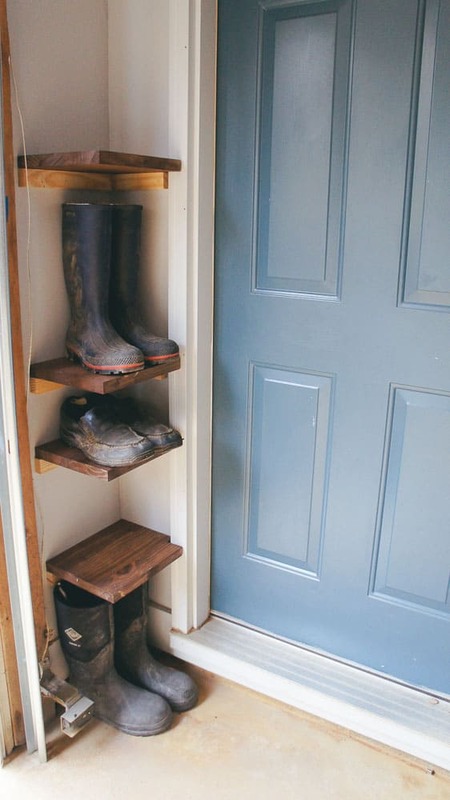 My husband utilized the narrow space by the door by building shelves for work boots. Now they can stay out of my house and out of the door way. Double win! 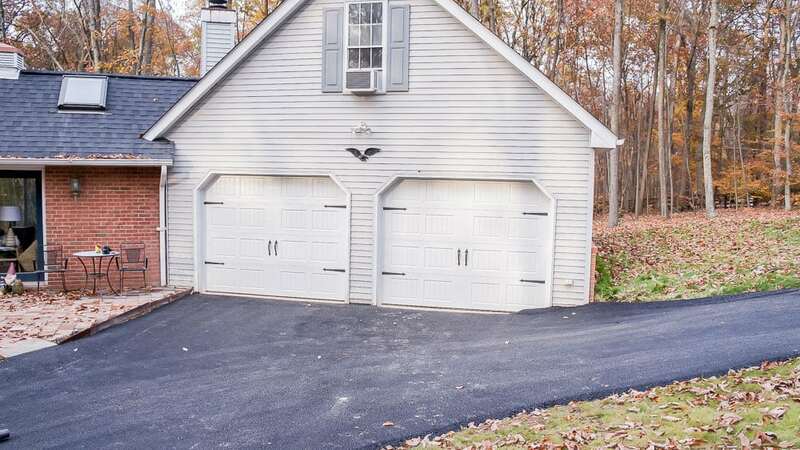 The most expensive change was getting new garage doors. The old ones were so bad. These are dreamy and one of the more affordable options available. They make such a difference on how the house looks now. We didn’t get to changing out our spotlight or removing the eagle, but I’m okay with that. Until spring. 😉 Or maybe we will get one more random warm day to finish everything up. Fingers crossed for some freak warm days so I can work in my lovely vintage inspired garage. Wow, what an amazing makeover. 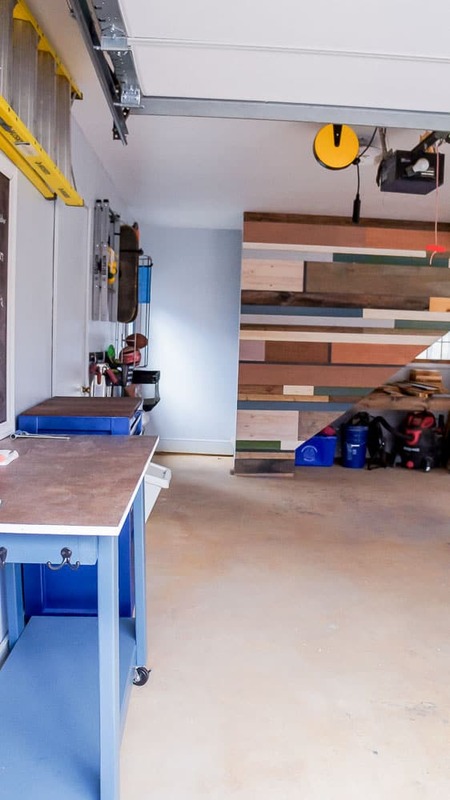 Your garage is every DIYers dream. It looks so organized and functional. Great work! Thanks Dannyelle! I can’t wait to work more in it. looks so nice and organized!!! now you can come do mine next!!! 😉 love the bottle opener, too- perfect celebratory touch! 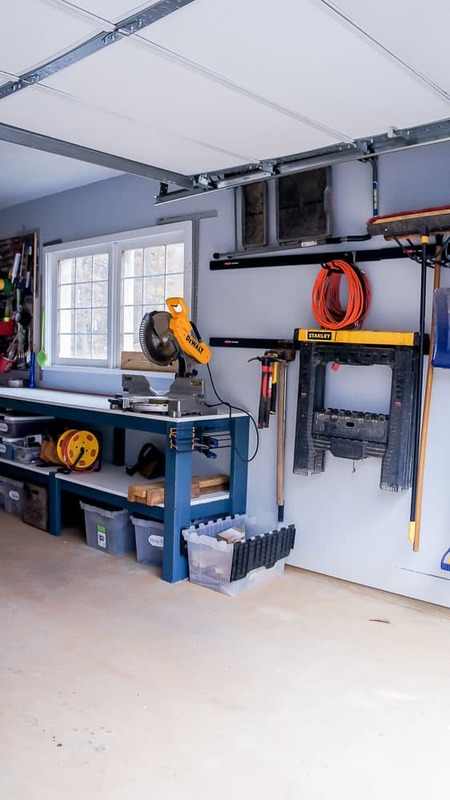 Emy, I have never seen a prettier and more functional garage. Can I bring my projects over?! Scrap wood wall = AWESOME!! And seriously, you need to teach my hubs a lesson on organizing his stuff. Our garage is a catastrophe. 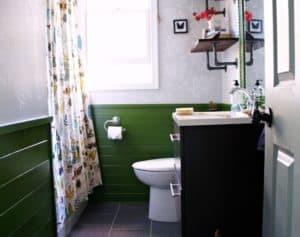 Peg wood grain wall, I need me one of those! Retractable extensions cord..I didn’t even know that existed! Great job!! 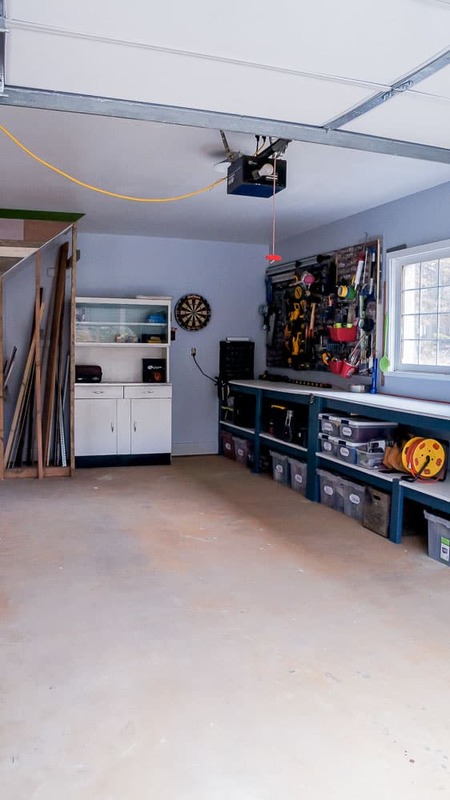 A functional garage with great storage is really important for a house! The scrap wood wall is SO cool! 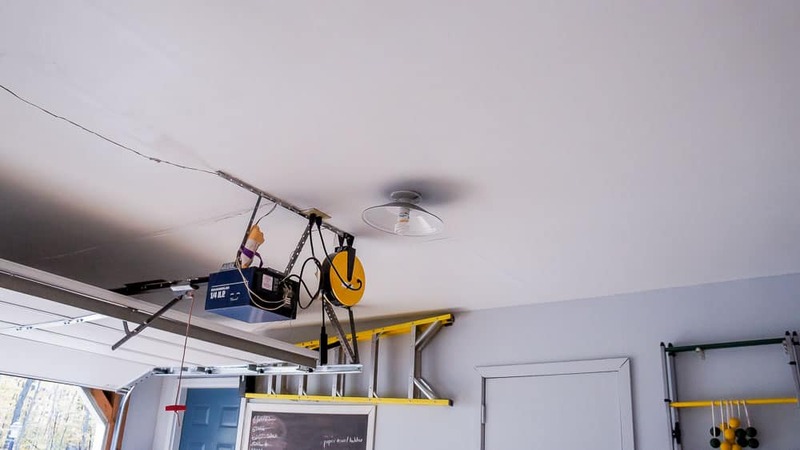 And yeah I agree with comment above – thanks for the retractable extension cord share, I didn’t know that existed either, and installed high above – that’s a great idea! Thanks Deb! 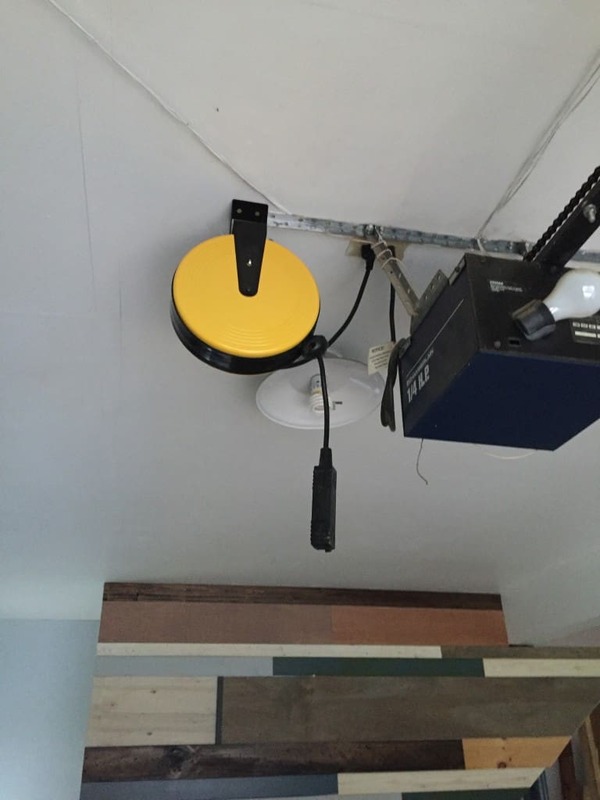 The retractable cord is plugged into the outlet for the garage door opener, so it makes use of an otherwise hard to use outlet. Wow! 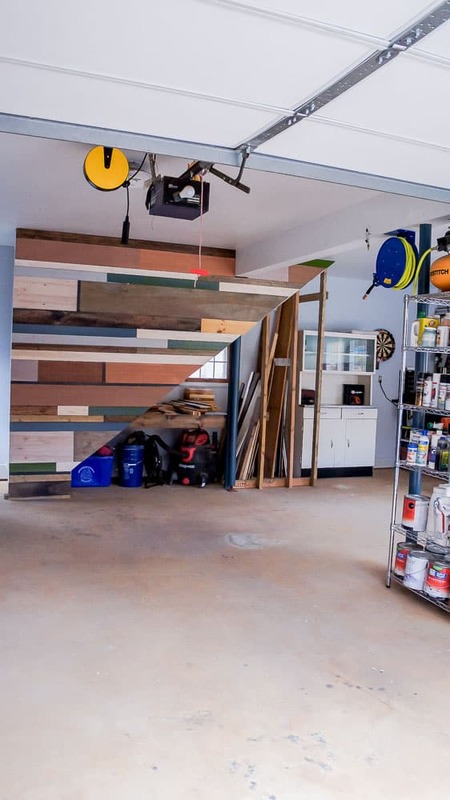 Most organized garage ever! Serious garage goals over here. Way to look on the bright side about the floor, and congrats on a successful ORC! talk about a job well done! 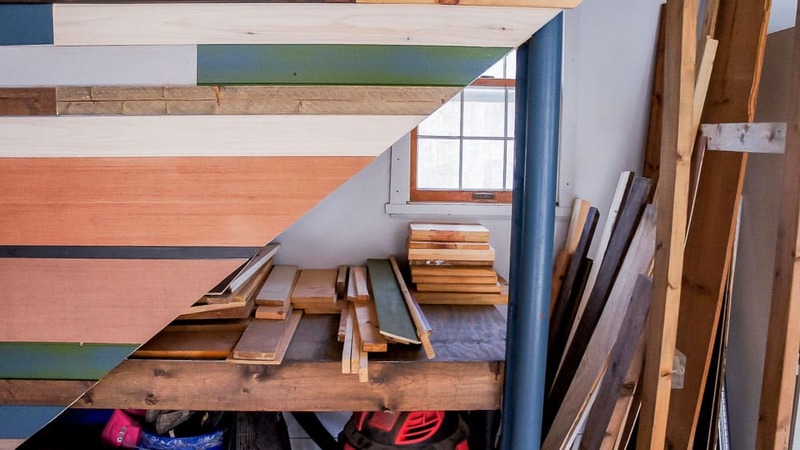 I am totally on board for that plank wall, and the organization makes me happy! 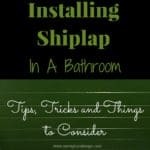 You should totally be pleased with this reno, it will make projects so much easier now. What a great transformation! 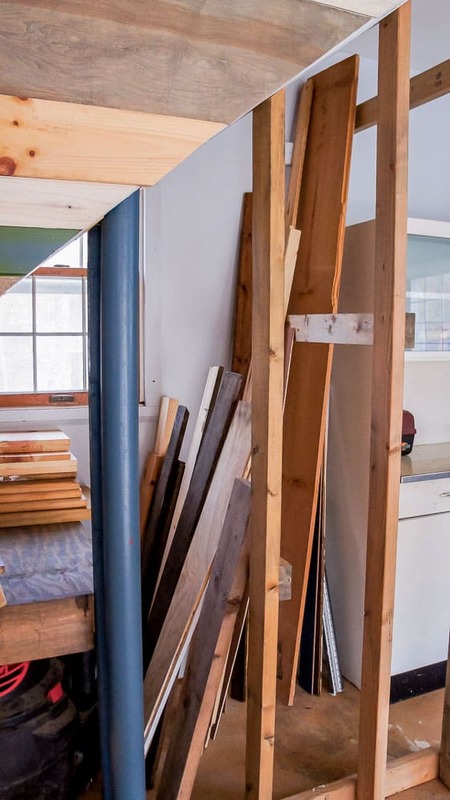 I love the plank wall – such a clever idea. 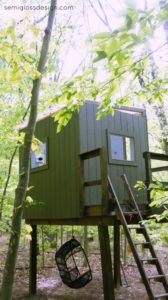 Awesome space to be productive in and spend quality time as a family creating! Thanks Joy! The plank wall was really fun to make. 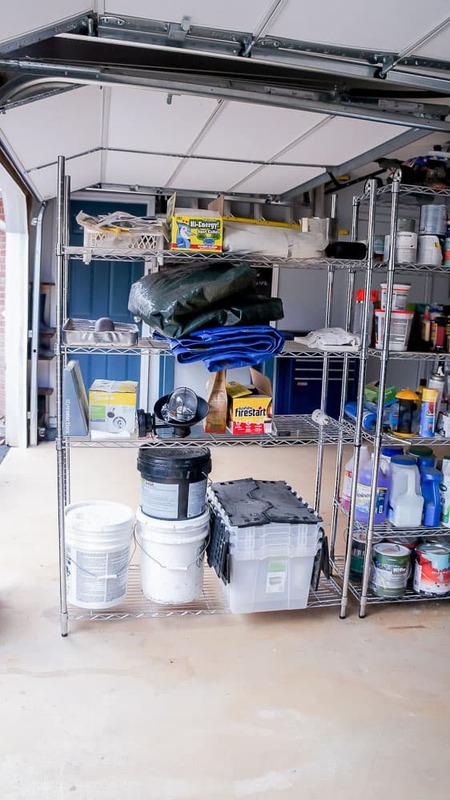 Never underestimate the the joys of a well organized garage. 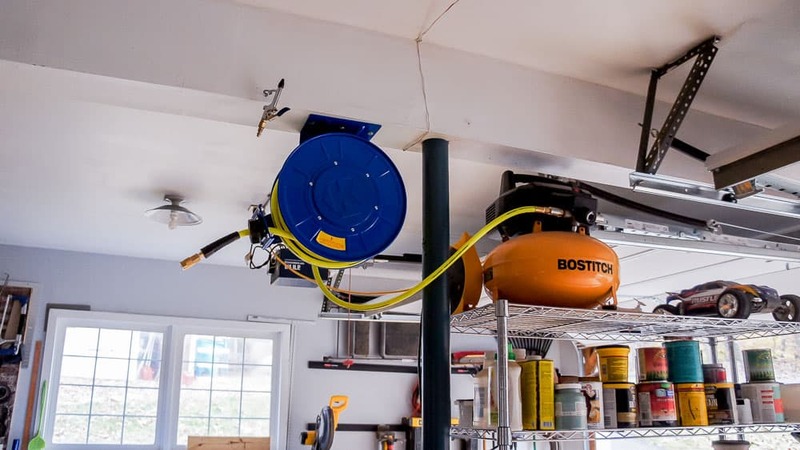 Mine is about half way there but I have to say I that ceiling mounted cord reel is now on my must have list. Well done! 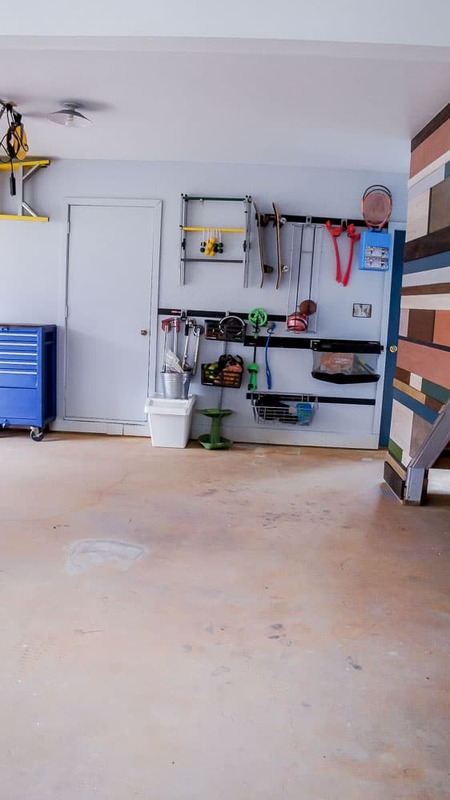 I love how useful AND pleasant your garage turned out! It’s nice to work on projects in a space where we’re comfortable and feel creative; nobody wants to spend all day working around a mess. I love the colorful wall! Way to go, Emy! Wow! your garage is immaculate! It wasn’t bad before, but now it’s a dream! A retractable extension cord? Get out! I want one. You worked hard on this space Emy. Wow! I am in love with your scrapwood wall. 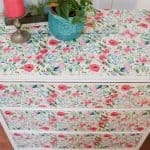 The color combo, and the varied widths of the wood make it look majestic. 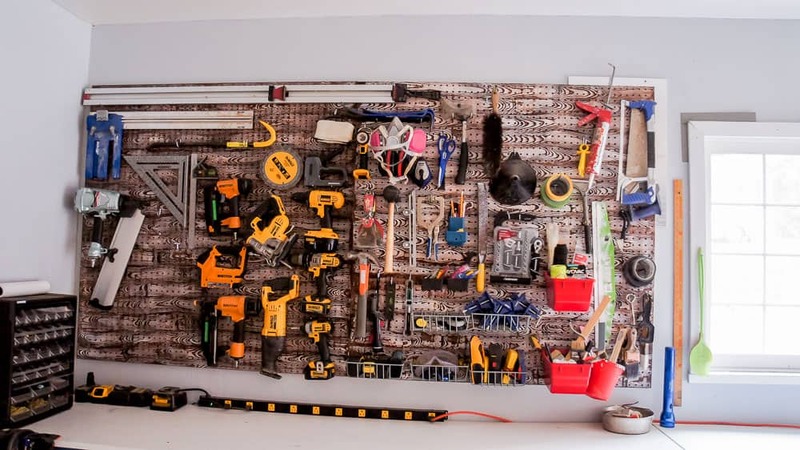 I also love your beautifully stained pegboard. Great job! I agree with you regarding the floor. 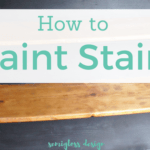 You will never cry over spilled paint. Kudoos to your ever-willing husband. 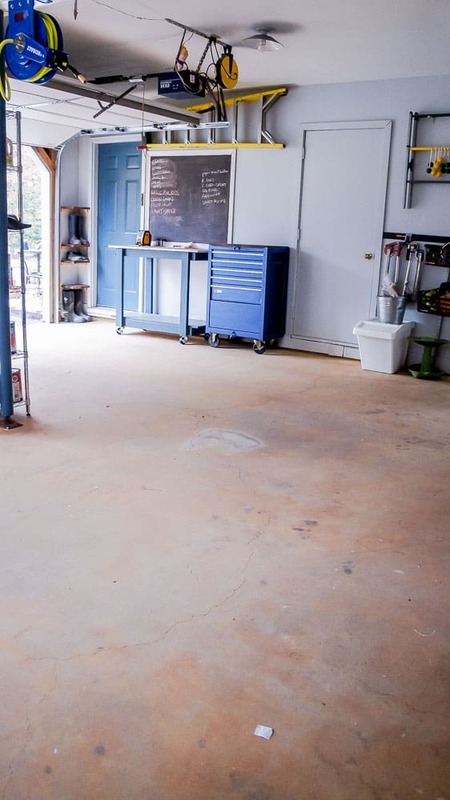 You have given me hope AND ideas for my own garage. :). You guys did a wonderful job!